Yarn in the City: The Great London Yarn Crawl: Refuge needs your knitting skills! Refuge needs your knitting skills! 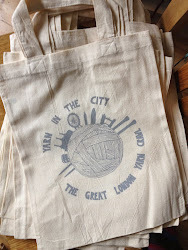 The 2014 edition of the Great London Yarn Crawl is barely less then six months away, and there's been a lot of planning going on behind the scenes here at HQ. One project that we'd like to introduce you to is a charity knitting call for Refuge, our charity partner in this community-building woolly endeavour. Refuge, as many of you already know, is a non-profit organization in London that provides support and services to women and children who have been subjected to domestic violence. We contacted them to see if they might be interested in receiving donations of warm and toasty knitted items for their shelters, and the response was enthusiastic! And we know that you knitters out there are warm and wonderful people who know that the gift of a hat, or a pair of mittens, or a scarf, is one that can mean so much more to someone in need then just an item of clothing. in a perfect world, they'd love mittens and hats for the wee ones, scarves and hats for older children, and scarf and hat sets for the women. Any items that you can knit up over the next few months will be very gratefully received. We will collect everything at the PPQ after-party on 20 September, and take the donations over to Refuge to be distributed to their shelters. As an added incentive, every item donated will earn you an extra entry into the grand prize raffle drawing at the after-party. What is the grand prize raffle drawing you ask? Well, that will be detailed in a later post, but suffice to say it will be more than a door prize and super full of extra fabulous goodies. If you'd like to knit something up, but aren't able to do it out of your own stash, please contact us - we have come into a supply of yarn that would be perfect for charity knitting, and we are happy to pass it along to you for this purpose. Email us at greatlondonyarncrawl AT gmail DOT com with the subject line "Charity Yarn" and we will get back to you. If you're in need of some new patterns to try out to get your knitting mojo flowing, Rachel is offering a discount on any of her hat/scarf/mitten patterns on Ravelry. Just enter the coupon code "GLYC2014" in the appropriate place when you check out to get 15% off the purchase price - this promotion will run up until GLYC 2014, on 20th September. We hope you are all doing well, and looking forward to this year's event. We certainly are!